This funding allocation is problematic because there is no data to suggest that class-size reduction or professional development widely or consistently impact student achievement. Research shows that the effects of class-size reduction are restricted to only certain grades, with particular influence on students in early elementary grades. And while some districts and schools have been able to crack the code to ensure that teacher professional development positively impacts student learning, it is not happening at scale. Just like its predecessor No Child Left Behind, the Every Student Succeeds Act (ESSA) allows states and districts to spend Title II funding on much more than just class-size reduction and professional development. Funds could be devoted to teacher certification, licensing, preparation, recruiting, evaluation, and so on. There is a dearth of research on these and other teacher-quality activity allowances in Title II. But we must invest in new policy areas when leaders know the current ones aren’t translating to better student learning. 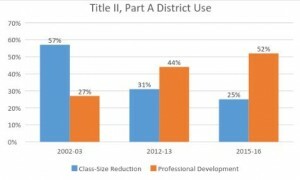 States and districts may continue to fund class-size reduction and professional development with Title II dollars, and that may well make sense for their local needs. But regardless of how to funds are allocated, states should put processes in place to monitor and report on the use of funds and the impact they have on student learning to help build a body of best practices for Title II use. In today’s political climate, it’s hard to predict what will happen. Regardless, it’s probably safe to say that Trump’s proposal to eliminate Title II isn’t likely to pass through Congress and come to fruition as written in his proposal. However, the uproar over the mere mention of it provides advocates and policymakers the opportunity to reconsider Title II funding use.